The largest city in New England (and the 23rd largest in the United States), there’s just something about Boston, Massachusetts that feels so magical and alive. With its rich history, stunning waterfront views, and renowned higher education, it happens to be one of our all-time favorite settings for Venuelusting. Today, then, we’re so excited to break down 20 beautiful Boston venues for all of our East Coast-loving event-hosts out there. Get ready to make your way across the harbor and explore age-old chapels—we’ve got a great roundup for you today. We kick off our list of beautiful Boston Venues today with Alden Castle, a space rich in both history and aesthetics. Just minutes from the heart of downtown Boston, this Tudor-style building was originally built in the 1920s and recently renovated in 2014. We’re particularly in love with its easy-to-access location and its two jaw-dropping event spaces. The Vintage Ballroom (above) boasts towering ceilings, oversized windows, storied chandeliers, and a separate lounge and balcony that overlook the ballroom area. It can accommodate up to 100 guests for a standing reception, or 250 for a seated dinner. The Modern Club room (above) offers guests an aesthetic both striking and grand, with its all-original gold-leaf ceilings, floor-to-ceiling windows, and Murano glass chandeliers. It can host up to 300 guests for a reception, or 150 guests for a seated dinner. Next up, we head to a spherical venue so stunning that it still has our heads spinning. The Cyclorama at the Boston Center for Arts features a number of unforgettable design elements, our favorite of which happens to be its striking copper skylight dome that sits pretty atop 23,000 square-feet of round, brick-lined space. Opened in 1884 (and included on the National Register of Historic Places), this storied setting can host anywhere from 100 to 1,000 guests (or up to 875 for a seated affair)—making it a perfect option for everything from grand weddings to large-scale corporate events. No list of Boston venues would be quite complete without a nod to the city’s most renowned higher-education institute. For Harvard grads, Bostonians, and history-buffs alike, we love the idea of hosting a stunning wedding ceremony at the Memorial Church at Harvard University. The church can hold up to 1,000 guests for a seated soirée and welcomes weddings of all denominations. We’re particularly in love with the space’s stunning architecture—grand columns, hardwood flooring, and a plethora of natural light make for a setting both spiritual and ethereal. Next up, we head to The State Room, a stunning space that boasts expansive views of the Boston Harbor and the bright city lights that surround it. The State Room sits at the very top of Sixty State Street skyscraper and offers an aesthetic both modern and urban for that next swanky soirée of yours. We especially love that its clean, contemporary design aesthetic makes for a perfect blank slate for nearly any type of affair—allowing you to create whatever atmosphere you choose in this striking space. The State Room offers four main event spaces to choose from: The Great Room (above) boasts an all-glass wall that measures 120 feet wide by 20 feet tall and offers what some say is the best view in all of Boston (and we happen to agree). It can host up to 900+ guests for a reception, and 599 for dinner. The Harborside Salons (above) boasts panoramic city views and gorgeous mahogany hardwood flooring. It can accommodate up to 420 guests for a reception or 200 for a seated affair. The Cityside Salons can be combined with the Great Room or broken down into smaller areas. It boasts a beautiful Onyx bar and can host up to 360 guests for a reception, or 180 for a seated dinner. Finally, The Loft acts as a VIP lounge space for the Great Room. It boasts its own private entrance and can accommodate up to 150 guests for a reception or 100 guests for a seated dinner. Number 5 on our list of unforgettable Boston venues takes us to a waterfront venue like no other in the city. The Exchange Conference Center boasts early-20th-century-style architecture, unbelievable views of the harbor, and a rich history (as it was previously home to the famous Boston fish auction). With a three-story skylit atrium and a connected harbor terrace, this venue is cloaked in natural light and an aesthetic that feels as historically Boston as they come. Event spaces range from the grand (The Exchange Hall, pictured above) to the intimate (the second-floor cocktail space), making this the perfect setting for everything from full-scale weddings to personal parties. Next up, we head to 9OFS (OFS short for “One Federal Square”), an indoor/outdoor event venue centrally located in the heart of historic downtown Boston. With an open-air garden, a mesmerizing reflection pool, and a front-row seat to jaw-dropping views of Boston’s stunning skyline, not much needs to be done with this space—as it makes for a striking backdrop for nearly any affair on its own. We especially love the idea of booking 9OFS for an outdoor nighttime affair, as, with the right lighting, it makes for an unbelievably dreamy atmosphere for an outdoor wedding reception, vow renewal, or corporate cocktail party. Our roundup of unbelievable Boston venues wouldn’t be complete without at least one historic mansion. Number 7 on our list, then, takes us to the renowned Hampshire House, a turn-of-the-century mansion situated atop Boston’s historic Beacon Hill. Built in 1910, no design stone was left unturned when crafting this five-story Georgian-style venue. Italian marble, carved Oak, crystal chandeliers, and Palladian windows work together to create an aesthetic that feels oh-so-grandiose (in the best possible way). Weddings at the Hampshire House range from the grand to the intimate, as the space allows for countless customizable spaces to choose from. For the well-read couple, we are swooning over the idea of a ceremony in the mansion’s stunning library (above). And, for photographs you’ll cherish forever, the mansion’s foyer offers tons of natural light, which makes for truly striking shots. Number 8 on our list brings us to another stunning university setting for your next soriée. The Chapel at MIT makes for a striking backdrop for intimate wedding ceremonies for those with certain MIT affiliations (student, alumni, faculty, staff, or child of any of the previous). The chapel can seat up to 150 people for your ceremony, and, while no specific denomination is required, the ceremony must be spiritual in nature and cannot be performed by a justice of the peace. If you meet the requirements, though, the chapel itself is absolutely stunning. A round room cloaked in classic red brick boasts one of the most ethereal ceremony spaces we’ve ever seen: a circular skylight blankets couples with natural light while a suspended sculpture creates a backdrop that’s nothing short of magical. Number 9 on our list of stunning Boston venues takes us to what is perhaps the most historical setting of them all. The city’s Old South Meeting House was the site of the beginning of the Boston Tea Party in 1773, making it a perfect event space for Venuelusting history buffs and proud Bostonians alike. Located in the heart of Boston nestled amongst its striking skyscrapers and bright city lights, few venues on Earth feel as storied and as alive as this one. Weddings at the Old South Meeting House can accommodate up to 250 people on the first floor and 300 on the balcony for ceremonies, but are limited to 100 guests for receptions, as the space is best suited for ceremonies (rather than large parties). We couldn’t complete our roundup of Boston venues without a nod to the city’s famous Opera House. So, for Number 10 on our list, we head to one of the most stunning settings we’ve ever laid eyes on. Built in the 1920’s, every square inch of this expansive theatre is adorned with thoughtful, historic design details (like carved wood accents, striking marble columns, and gorgeous archways). We especially love that, with its countless event space options, the Opera House can accommodate nearly any type of affair. Intimate soirées do well in the theatre’s lobby areas, while grand dinners fit perfectly on the venue’s main stage. Next, we head back to the waterfront where the Boston Harbor Hotel offers guests five stunning venues to choose from for their unforgettable affair. Aside from its striking views of the harbor’s sparkling waters, we especially love the hands-on service the hotel provides—whether you’re looking to host a small dinner or a grand wedding, hosts are offered top-notch creative consultations to help bring their vision to life. Spaces range from the 5,488-square-foot Wharf Room to the multiple-story Rotunda, which sits pretty under a stunning 80-foot dome. Number 12 on our list might just be the most unique Boston venue option of them all. The Liberty Fleet of Tall Ships offers chartered ships that sail the harbor for everything from engagement parties to post-wedding brunches. With countless catering options, a full bar, space for a live band, and, of course, ever-changing views of Boston’s sparkling waters, this is the perfect option for everyone from couples looking to host an unforgettable wedding ceremony to photographers seeking the perfect setting for their next shoot. For the Boston-based art-loving couple, we love the idea of saying "I Do" at Boston’s Institute of Contemporary Art (ICA). Streamlined architectural details and modern design elements come together to create a sleek and oh-so-urban design aesthetic. 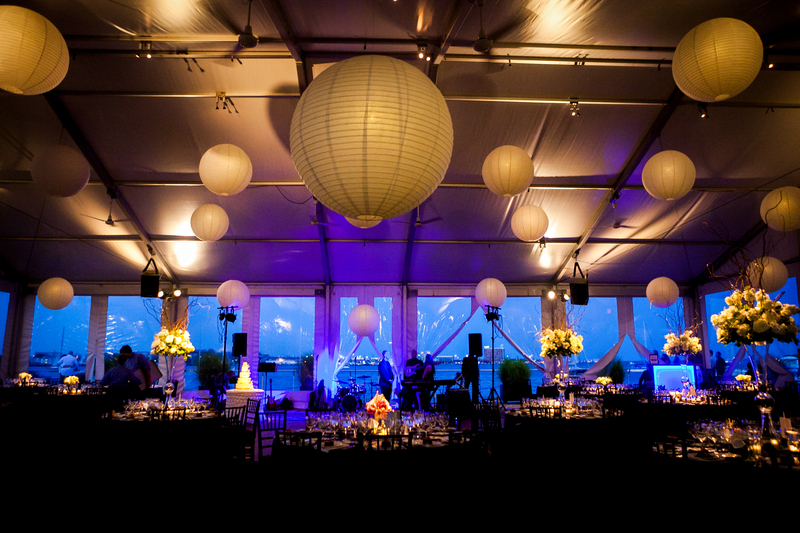 The ICA also boasts breathtaking views of the Harbor and city skyline, making for a stunning setting for any affair. We also love that events at the ICA are catered by Wolfgang Puck catering, so you can be sure your guests are dining on the most delectable of plates. Next up, we head to the historic Boston Public Library, where bookworms and architect lovers alike will find themselves swooning over this stunning and storied setting. The Boston Public Library offers countless spaces for your next event, each boasting ornate design details and an historic aesthetic—so not much needs to be done on your end to create a celebration-worthy setting. We especially love the idea of hosting a dinner at study tables under charming library lights (pictured above). Considered the city’s “greenest” venue, Boston’s Artists for Humanity Epicenter makes for a stunning setting for eco-conscious couples to host their nuptials. Floor-to-ceiling windows and sleek, streamlined architecture come together to create something a little bit urban and a whole lot chic. A 5,000-square-foot loft-style gallery space boasting bright, beautiful paintings and photographs (below) can accommodate up to 250 of your closest friends and family for an artsy affair like no other. Next on our list of incredible Boston venues, we head to the Seaport Hotel, where a waterfront setting and stunning ballrooms make for the perfect event space options for those looking to host a grand Bostonian affair. We especially love the all-inclusive nature of wedding packages at Seaport. Couples are offered a personal wedding planner, personal menu tastings, and their choice of five ballrooms and/or outdoor/garden spaces. Nestled amongst Boston’s historic waterfront, the Battery Wharf Hotel offers guests a both charming setting and impeccable service for their next soirée. Wedding celebrations at the Battery Wharf can accommodate up to 175 guests for outdoor ceremonies situated along the water or indoor receptions in the hotel’s ballroom. Our list of beautiful Boston venues wouldn’t be complete without at least one of the city’s memorable museums. For Number 18 on our roundup, then, we head to the Boston’s stunning Museum of Science. Located right along the Charles River, the Museum of Science offers guests expansive views of both the Boston and the Cambridge skylines. Event spaces range from a private suite with an adjoining balcony (above) to a quaint cafe to the fan-favorite Skyline Room. Hosts may also rent out the entire museum for large-scale affairs. With countless customizable options, the museum can accommodate events ranging anywhere from 25-4,500 guests. For those who love underwater life, Number 19 on our list brings us to the New England Aquarium, where Venuelusters can hosts affairs ranging from corporate dinners to full-scale weddings. The aquarium boasts views of the city’s historic harbor and skyline and, of course, backdrops of mesmerizing aquatic animals. It also offers hosts a number of stunning space options to choose from depending on the size of their event. Number 20 on our list brings us to Boston’s Bastille Kitchen, a charming space that feels rustic, intimate, and oh-so East Coast. Exposed brick walls, wooden beams, and thoughtful low lighting make for a lodge-like space that doesn’t need much dressing up for that next party you're planning. Bastille offers two main event spaces for everything from engagement parties to private holiday dinners. But, whatever you’re planning, be sure to bring a photographer along—Antique French doors, natural light, and hardwood floors make for a stunning setting that you’ll want to capture for years to come. Have any must-see Boston venues we missed? Share them with us in the comments section below. We'd love to hear from you.